Like many, I tend to pause and reflect at the end of every calendar year, taking stock of what has occurred and what I have accomplished. I like to do the same with this blog. I’ve had just over half a million page views in 2013 (520,000 as of the Dec. 27). That up 200% from 2012 (169,000). I now have 2,400 subscribers receiving our weekly email with links to that week’s posts. I published a total of 190 posts, not including the few I expect to post before New Years. 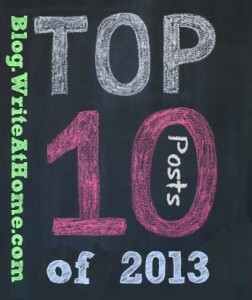 Below are the ten posts that got the most views this year. 1. Myth Buster: How Many Sentences Must a Paragraph Have? This post, written in October of 2011, has attracted more far more page views than anything I have written. This is certainly due to its top placement in Google for searches about the number of sentences necessary for a paragraph. I wish I had a dozen articles with that kind of placement. I created this list of 200 alternatives to the dull verb go/went in October of 2012, and it has proven quite popular. The digital poster has been shared around Pinterest and Facebook, attracting lots of people here. What’s interesting is that I updated the list to 250 soon after, but the shorter list had already gained more momentum. I honestly feel a bit guilty about this one. I wrote an article discouraging writers from seeking elaborate substitutes for said, as they are most often awkward and distracting. Most of the best novelists stick to said and asked, letting the dialogue do the work without unnecessary descriptive tags. But while writing that article, I had fun creating a long list of alternatives to said. I challenged myself to come up with 100, and when I succeeded, I just had to share them. So now teachers all over the place are using my list to encourage students to do the opposite of what I recommend. Oh well, at least it gets my blog a ton of traffic. Apparently, blog posts that include long lists are in high demand! This list isn’t mine, actually. I found it at American-Heritage Dictionary’s site. I just went the extra mile and created links to the definitions and added an online quiz. Folks seem to like the quizzes. The same idea as the list for high school freshmen. This is another old post that does well on Google searches. It includes a pinnable poster and a brief explanation of the four modes: narration, description, exposition, and persuasion. I wish I had created this infographic. I just shared it in a post. It’s quite encouraging to hard-working homeschool families. This was the first of the 100 Words posts and the first quiz I created. I wouldn’t have guessed this post would attract so much traffic, but I chalk it up to Google. This was a fun post dedicated to my wife on Valentine’s Day, 2012. Apparently, lots of people have enjoyed it as much as she did. Popularity is one thing, but here are the posts that I most enjoyed writing this year. As a reformed grammar Nazi, I make an appeal for some reasonable civility. I love words. This post looks at a particularly interested set of them. I could have listed any of the posts in this emerging series. I’m pretty excited about talking more about logic and informal fallacies. I’ve always believed that nerds have more fun. I explain in this post. 5. What Is a Phrasal Verb? I may be a former grammar Nazi, but I’m still a grammar nerd. Discovering phrasal verbs helped me make sense of common English sentences that previously had me confused. I enjoyed explaining this obscure concept. All of my students know my motto, It’s good to know stuff. This three-part series on the intrinsic value of knowledge just might inspire you or your students. Yes, adverbs are typically overused by young writers, but to suggest that they are always bad is going too far. This post took a lot of time and effort, and I think the results are interesting and informative. This post is a good resource. Reduplication is a kind of word play most people don’t even know there’s a name for: clap trap, tip top, hurly burly, etc. I’ve always loved the creative, evocative words used to identify animal groups: a romp of otters, an ostentation of peacocks, a bloat of hippos. If you only have time to read one post, I’d really like you to read this one. Do you have a favorite not listed here? Please tell me in the comments below. Any comment or question is welcome. What about the memes? By far, those are my favorite. I also liked Why Multitaksing is Bad for Learning. Yeah, but that wasn’t my original stuff. I agree it was good. That’s why I shared it.